Games became popular, within the formal verification community, after their application to automatic synthesis of circuits from specifications, and they have been receiving more and more attention since then. This paper focuses on coding the Sokoban puzzle, i.e., a very complex single-player strategy game. We show how its solution can be encoded and represented as a Bounded Model Checking problem, and then solved with a SAT solver. After that, to cope with very complex instances of the game, we propose two different ad-hoc divide-and-conquer strategies. Those strategies, somehow similar to state-of-the-art abstraction-and-refinement schemes, are able to decompose deep Bounded Model Checking instances into easier subtasks, trading-off between efficiency and completeness. We analyze a vast set of difficult hard-to-solve benchmark games, trying to push forward the applicability of state-of-the-art SAT solvers in the field. Those results show that games may provide one of the next frontier for the SAT community. A. Church, "Logic, arithmetic, and automata," International congress of mathematicians, Djursholm, Sweden, pp. 23-35, August 1963. P. J. G. Ramadge and W. M. Wonham, "The control of discrete event systems," Proceeding of the IEEE, 77(1), pp. 81-98, January 1989. T. Wolfgang, "Infinite games and verification," in Ed Brinksma and Kim Guldstrand Larsen editors, in Proceedings of the Computer Aided Verification Confernce (CAV), London, UK, Springer, pp. 58-64, September 2002. W. Thomas, "Infinite games and verification," in Ed Brinksma and Kim Guldstrand Larsen editors, in Proceedings of the Computer Aided Verification Conference (CAV), volume 2102 of LNCS, Springer-Verlag, Copenhagen, Denmark, pp. 58-64, July 2002. R. Alur, P. Madhusudan, and W. Nam, "Symbolic computational techniques for solving games," International Journal on Software Tools for Technology Transfer (STTT), pp. 118-128, January 2005. I. P. Gent and A. G. D. Rowley, "Encoding connect-4 using quantified Boolean formulae," in Proceedings of the 2nd International Workshop on Modelling and Reformulating Constraint Satisfaction Problems, Kinsale, Ireland, pp. 78-93, 2003. C. Ansotegui, C. P. Gomes, and B. Selman, "The Achilles' heel of QBF," in Proceedings of the 20th National Conference on Artificial Intelligence (AAAI05), Pittsburg, Pennsylvania, AAAI Press, pp. 275-281. July 2005. ISBN: 1-57735-236-x. I. Lynce and J. Ouaknine, "Sudoku as a SAT problem," in Proceedings of the 9th International Symposium on Artificial Intelligence and Mathematics, Fort Lauderdale, Florida, January 2006. A. Sabharwal, C. Ansòtegui, C. P. Gomes, J. W. Hart, and B. Selman, "QBF modeling: exploiting player symmetry for simplicity and efficiency," in Proceedings of the 9th International Conference on Theory and Applications of Satisfiability Testing (SAT06), volume 4121 of LNCS, Springer-Verlag, Seattle, Washington, pp. 382-395, August 2006. 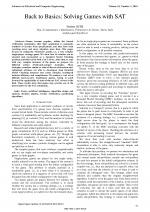 J. P. Marques-Silva and K. A. Sakallah, "GRASP - a new search algorithm for satisfiability," in Proceedings of the International Conference on Computer Aided Design (ICCAD), November 1996. H. Jin and F. Somenzi, "CirCUs: a hybrid satisfiability solver," in Proceedings of the 7th International Conference on Theory and Applications of Satisfiability Testing, Vancouver, BC, Canada, May 2004. T. Walsh, C. Thiffault, and F. Bacchus, "Solving non-clausal formulas with DPLL search," in Proceedings of the International Conference on Theory and Applications of Satisfiability Testing, volume 2919 of LNCS, Springer-Verlag, pp. 663-678, 2004. L. Zhang, "Solving QBF with combined conjunctive and disjunctive normal form," in Proceedings of the 21th National Conference on Artificial Intelligence (AAAI06), Boston, Massachusetts, AAAI Press, pp. 143-149, 2006. ISBN: 978-1-57735-281-5. A. Biere, A. Cimatti, E. M. Clarke, M. Fujita, and Y. Zhu, " Symbolic model checking using SAT procedures instead of BDDs," in Proceedings of the 36th Design Automation Conference, New Orleans, Louisiana, IEEE Computer Society, pp. 317-320, June 1999. J. Whittemore, J. Kim, and K. Sakallah, "SATIRE: a new incremental satisfiability engine," in Proceedings of the 38th Design Automation Conference, New York, NY, USA, ACM Press, pp. 542-545, June 2001. ISBN: 1-58113-297-2. N. Een and N. Sorensson, "Temporal induction by incremental SAT solving," in First International Workshop on Bounded Model Checking (BMC03), Boulder, Colorado, pp. 58-64, July 2003. H. Cho, G. D. Hatchel, E. Macii, B. Plessier, and F. Somenzi, "Algorithms for approximate FSM traversal based on state space decomposition," IEEE Trans. on Computer-Aided Design of Integrated Circuits and Systems, 15(12), pp. 1465-1478, 1996. 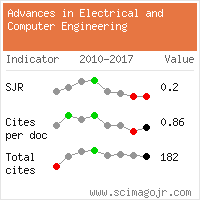 Citations for references updated on 2019-04-20 21:13 in 123 seconds. Website conception, design and maintenance by Eugen COCA. Content updated on 28 Feb 2019. Site engine updated on 28 Feb 2019. This page was generated on the server in 0.068 seconds and loaded in your browser in > seconds.